Filipov ejected and landed on the ground, but was quickly surrounded by rebels. Armed with a Stechkin pistol, he hid behind a stone embankment and reportedly unloaded a clip before getting wounded. As the rebels approached, he apparently shouted “this is for the boys!” and then detonated a grenade. Filipov’s body has since been recovered, according to Reuters. 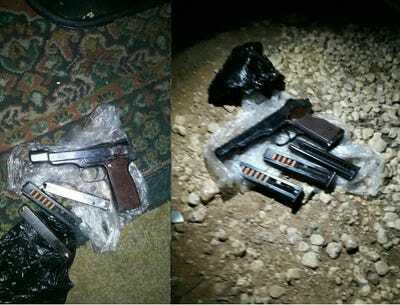 Screenshot/Twitter via @miladvisorThe alleged Stechkin pistol used by Filipov. Russia and the Syrian regime have apparently responded with massive air raids since Filipov was killed.Russian state-owned media reported shortly after the Su-25 downing that Russian forces killed at least 30 terrorists in the region. “The United States is gravely alarmed by continued allegations of the use of chlorine gas by the Syrian Regime to terrorize innocent civilians, this time in Idlib Province near Saraqib,” the US State Department said in a statement on Monday night.